China has emerged as a leader in both the supply of—and demand for—electric vehicles. Electric vehicle: according to Mc Kinsey research, approximately 375,000 electric vehicles (EVs) were manufactured by Chinese OEMs in 2016—an impressive 43 percent of EV production worldwide. That’s no fluke; Chinese OEMs achieved a 40 percent global share in 2015. OEMs from around the world (Chinese manufacturers among them) also produced approximately 332,000 EVs within China in 2016, and the country now has the largest number of EVs on the road—overtaking, for the first time, the number of EVs in the United States. The performance of Chinese EV manufacturers and suppliers, and the favorable conditions for EVs within the country itself, are reflected in China’s strong position on the McKinsey Electric Vehicle Index, or EVI (exhibit). Since 2010, our EVI has analyzed the overall state of play for EV producers and national markets across two equally weighted dimensions: supply and demand. Supply indicators address the industry side, that is, OEMs and suppliers within each country; we consider factors such as current and projected EV production and the manufacture of key components, including e-motors and batteries.1 Demand indicators assess EV share of a given country’s market and go beyond just accounting for the number of vehicles sold. Among other things, we measure elements such as incentives (including governmental subsidies), existing infrastructure, and the number of EV models offered in various vehicle segments within each indexed country. For 2016, we examined 15 countries, including major ones in Asia, Europe, and North America. The Chinese outperformed on both the supply and demand Electric Vehicle Index (EVI) dimensions. On the supply side, China’s government has made it a priority to create favorable conditions for EV stakeholders, including investors. The country’s components suppliers offered a boost, as well; for example, China’s lithium-ion battery-cell players now account for about 25 percent of global supply. As for demand, China’s high marks are evidenced not only by the number of vehicles sold but also by the variety of choices available. Approximately 25 new EV models were introduced to the Chinese market in 2016. All told, a Chinese consumer can now choose from around 75 EV models—more than in any other country we’ve measured. Whether these electric vehicle (EV) dynamics will hold in China for the longer term is harder to predict. 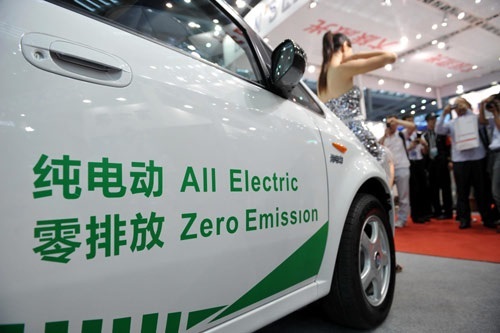 Currently, in several of the country’s major cities (including Beijing and Shanghai), EVs are exempt from license-plate lotteries and significant registration fees that apply for cars with internal-combustion engines. These exemptions are critical levers to make purchasing an EV more attractive, especially for younger, first-time car buyers. In all, China provides monetary subsidies that, for a representative, midsize car, amount to approximately 23 percent of total EV price. For comparable vehicles, that’s lower than the subsidies available in Scandinavian countries such as Denmark (49 percent) and Norway (45 percent), but higher than the subsidies provided by countries such as the United States (18 percent), Germany (13 percent), and Japan (10 percent). Going forward, China has announced that, after 2020, it will gradually begin to shift from direct subsidies to nonmonetary incentives. It’s worth noting, too, that even as China now outperforms in the absolute number of EVs sold, the country does less well when its EV sales are considered in relative terms. Case in point: Chinese EV penetration in its light-vehicle market was 1.4 percent in 2016; in Norway, it was about 24 percent. Still, indications are strong that China will be in on EVs for the long term. In 2016, the country expanded its EV-charging infrastructure to a total of 107,000 public charging outlets—an increase of 118 percent over 2015. And additional McKinsey research shows that a majority of Chinese electir vehicle (EV) owners are eager to buy EVs again, and that the number of Chinese consumers who say they are interested in purchasing an EV has tripled since 2011. This article is part of our series China Pulse, which delivers insight into how digitization is reshaping China. Patrick Hertzke is an associate partner in McKinsey’s Detroit office, Nicolai Müller is a senior partner in the Cologne office, and Stephanie Schenk is an analyst in the Munich office. The authors wish to thank Russell Hensley, Daniel Holland-Letz, Stefan Knupfer, Nicholas Laverty, Patrick Schaufuss, Katherine Wolosz, Ting Wu, and Susan Zhang for their contributions to this article.